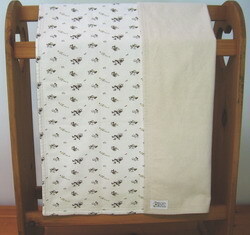 Can you find a quality, hand made organic flannel blanket? I couldn't. Then I came across Mummi Quilts, whom I met at the Childrens Trunk Show in Toronto. Tis' the season to make things all cozy and keep baby warm and we reach for our new organic flannel blankie to get Chunkles ready for his bedtime snuggle. This will be a keepsake for us. Earthy tones, organic and comfy and beautifully hand made in Canada by Eeva who is a mummi(which is Finnish for grandma). Thank you Eeva for sending us a blanket for review and for sponsoring this giveaway! Eeva would love to give to you one as well. 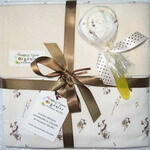 Just visit her site, she has some great sales on her merchandise(just in time for Christmas!) and she can even custom make a quilt for you.